Microblading Kit, Tools, and Training. in Flushing has been relocated to the Manhattan district effective 12.01.2018.
will become operational on Monday, 12.03.2018.
all new and returning customers to our Manhattan location and look forward to sharing our new space with you. Lydia Leung founded Tinny Beauty in 1977, pioneering Permanent Makeup in Hong Kong. Ms. Leung brought her unique techniques and experiences to the United States and Europe in 1982. Now, she has lent her decades of experience in ﻿Permanent Makeup﻿ to create the most refined Microblading techniques. During the past four decades, she has taught classes and courses all over the world, teaching plastic surgeons, nurses, tattooists, beauticians, estheticians, hair dressers, nail technicians, makeup artists, and more. Tinny Beauty is currently located in New York City. 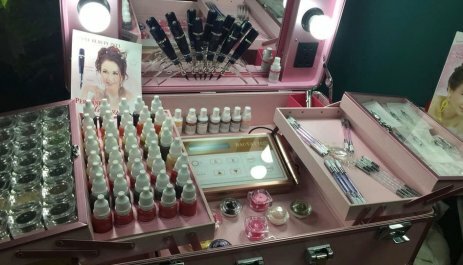 Tinny Beauty carries Permanent Makeup machines, Microblading tools; a full range of supplies such as: needles, blades, pigments, color milks and creams. Our patented Permanent Makeup device design has been a market-leader since its introduction. Learn more about Microblading supplies and training. Renowned artist and instructor Lydia Leung is a pioneer in Microblading and Permanent Makeup. Having taught classes, seminars and courses for distributors and instructors globally, she brings over 40 years of experience to Microblading, giving her unrivaled expertise during this recent Microblading boom. Tinny Beauty provides training with every Microblading Kit purchase. You will be well taught the highest-level Microblading techniques using the finest equipment available. Our Permanent Makeup kits and Blue Diamond Permanent Makeup device has been the choice of professionals around the world since its introduction to the market. 1 & a half days training w/Certificate. 2 & half days training w/Certificate. 3 & half days training w/Certificate. 4 & half days training w/Certificate. You can choose as many as from the following Break Down Packages in your day or days. The most money making professional MicroBlading Artist image in 2018. Complete guide to a High end Professional MicroBlading room set up . Very detailing Pigments study . All the factors may affected the pain sensation . Before & after care . No scab peeling technique . How pigments stay in skins . Why may or may not need touch up ? Special MicroBlading color layers effect on eye brows with different types of blades. How to set up your website . How to take professional MicroBlading commercial pics. Copyright © 2019 Tinny Beauty, Inc.